Wates Construction, the firm awarded a key contract to deliver over 200 new houses on a cluster of sites owned by Rotherham Council, is hosting an event for local suppliers this week. The Wates Group is one of the largest privately-owned construction, development and property services companies in the UK and has previously worked on projects to provide social and affordable housing in Canklow under its Wates Living Space brand. The Council is bringing forward some of its "more challenging" sites using a innovative development model. Wates successfully secured a multi million pound tender and will act as the Council's development partner to proceed with sites in Maltby, Canklow, East Herringthorpe and Dinnington. Wates and Rotherham Council are finalising plans for the delivery of 217 properties over the next three years. 83 are for private sale with the remainder being mixed tenure across six different sites. Following a comprehensive review of their supply chain data management systems and the providers of this technology available in the market place, Wates Group adopted Constructionline in a bid to streamline procurement processes and reduce risk across all its contracting divisions. Constructionline and the contractor are hosting a free event at Rotherham United's New York Stadium on November 24. The event will provide the opportunity to meet the suppliers of the trades required to complete this contract, identified as: scaffolding; joiners; bricklayers; plumbers; plasterers; electricians; decorators; tilers; floor layers. With overall developments costs of £29m, the initiative uses a Development Agency Model (DAM), where the Council acts as developer and Wates are the constructor and delivery agent. This is a new delivery route for the Council and creates the opportunity for it to maximise the value of its assets and deliver a greater number of high quality new homes, as opposed to simply selling the individual sites on the open market. Mick Holling, business director at Wates Residential, said: "Following the award of the site cluster project to Wates Residential, our team has been in close consultation with Rotherham Council to establish a deep-rooted understanding of the build technicalities involved and to develop a comprehensive build schedule for the scheme. "The council has set out an innovative vision for the scheme and our carefully selected project team is primed to deliver on these aspirations to create energy efficient homes that will fulfil the needs of local people." Cllr. 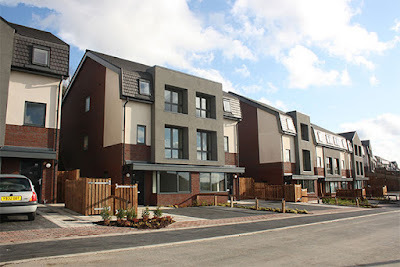 Dominic Beck, Cabinet Member for Housing, at Rotherham Council, added: "Wates were chosen for their forward-thinking designs, innovative approach and high standard construction processes and a tailored aftersales package. Wates is an experienced delivery partner and can expertly manage the entire process." The three-year programme is to be delivered in three phases, with building starting in 2017. It is envisaged that homes will be available for rent and sale from 2019. Creating extensions to the ghettos.Why waste money on new homes for people who dont respect em? ?